Asher Falatic added to Smash Gyms Staff at Both Locations! 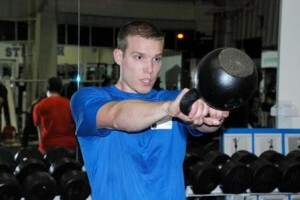 Asher is a certified athletic trainer and kettlebell instructor. He graduated with his Master’s Degree in Athletic Training from San Jose State University after moving from Ohio in 2009. While working as the assistant athletic trainer for the university’s football team he was exposed to kettlebells for the first time. Impressed by the challenging workouts kettlebells provided him, he quickly decided he wanted to be part of the cause. As a SFG I Kettlebell Instructor, Asher strives to work his clients hard and efficiently while implementing healthy lifestyle habits. Asher stays in shape by enjoying the outdoors through trail running and hiking. He continues to weight train and practice jujitsu. A special congratulations to our awesome Kettlebell instructor Asher for getting his Masters thesis published in the Journal of Strength and Conditioning! Fantastic effort, and we’re proud to have him as a part of our team! Remember, we have Kettlebell classes throughout the week; be sure to check our schedule for details! His classes are for people of all fitness levels. Asher is excited to help people at Smash reach their fitness goals!